Welcome to fall movie season, where it's all about awards bait if you look in one direction (hello, August: Osage County!) and all about oddball blockbusters if you look in another (happy to see you, Riddick). Like any other time for movie releases, autumn is all about what you make of it, whether that's catching the three-hour French drama about lesbians or counting down the days until The Hunger Games: Catching Fire. But if you want an advance look at which films are begging for awards and which are best paired with a giant tub of popcorn, look no further-- the line between profit and prestige is being drawn right here. 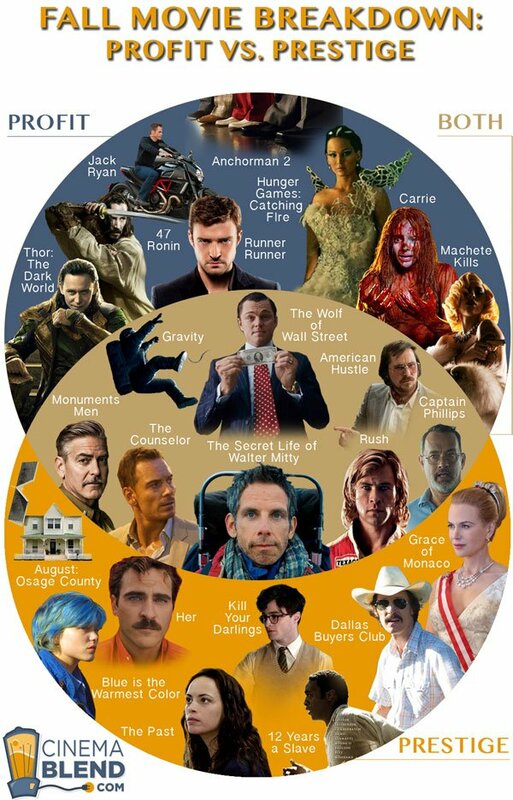 Check out our Venn Diagram, by our own Kristy Puchko, of some of the fall's biggest movies below for the Profit vs. Prestige rundown-- and which titles fall smack in the middle. You can also click to enlarge it! Here's the list of titles featured in the diagram, along with their release dates. Click on any title for everything else you need to know about the movie, and happy fall moviegoing!